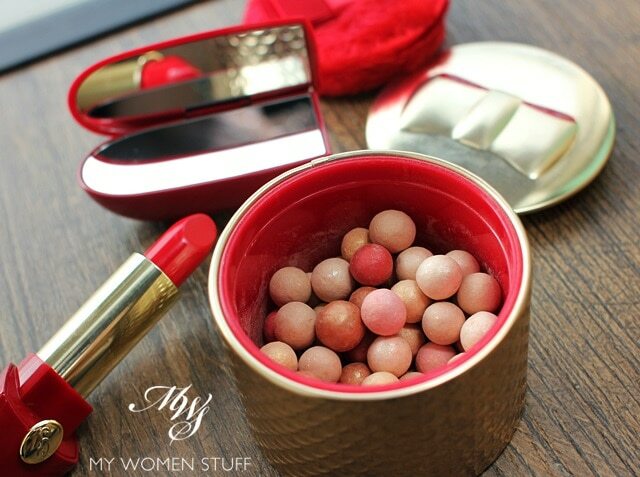 Home » FOTD » With the Meteorites Perles d’Etoiles and Rouge G Rouge Parade, Guerlain knocks pretty packaging out of the ballpark! With the Meteorites Perles d’Etoiles and Rouge G Rouge Parade, Guerlain knocks pretty packaging out of the ballpark! I’m usually quite taken by Christmas or Holiday makeup releases, but this year, I’m feeling a little underwhelmed by most of the offerings. It almost feels like I’ve seen them all before and in a sense, I might have. After a few years, things do start repeating themselves. 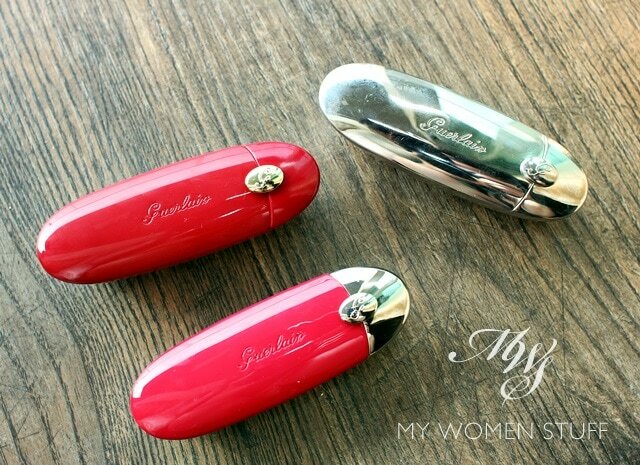 But there’s one item I always look out for – Guerlain Meteorites. It was quite a pain hunting these down, if I might just say so. Different department stores told me different things (most are only making them available in the 2nd week of November) but I managed to get my hands on the Guerlain Perles d’Etoiles Meteorites Illuminating Pearls and the limited edition Rouge G in Rouge Parade 820 at Parkson Pavilion KL. They don’t have the Petrouchka Eye and Cheek palette yet but I’m not planning to get it so I wasn’t fussed. I got these yesterday and tested them on today so this will not be an in-depth review. I’ll just share my thoughts, swatches and whether they’re worth getting, because it will cost a pretty penny. 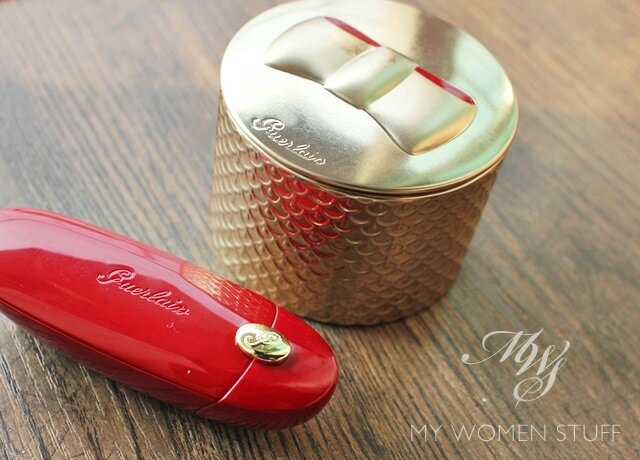 For the festive season, Guerlain has dressed up their signature Meteorites Illuminating Perles in a light gold case and a red interior. The sides are the usual fish scale design (Sorry, that’s how it looks like to me!) but the cover sports an embossed bow. 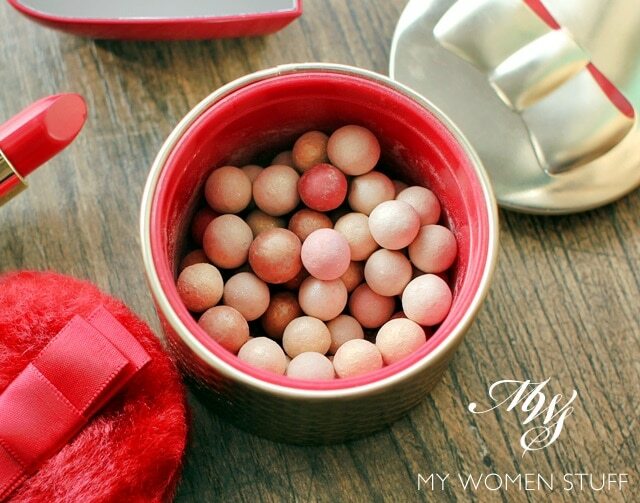 Instead of the flat sponge that’s usually included, the Perles d’Etoiles come with a red puff with a bow on top. Very festive and very pretty. The illuminating pearls however, don’t look as pretty in person as they do in the promotional picture. There are supposed to be 6 different coloured pearls in there, but I only really spotted 5 – bronze, beige, gold, pink and red. Like their regular Meteorites pearls, there is a mix of shimmer and matte and there’s absolutely no point swatching them because it is about the overall effect on your skin. I wore these today and I find that due to the bronze and gold coloured powders in there, it tends towards looking a wee bit warm so those with warmer skintones may that you appreciate this more than some of the other earlier lighter offerings. It isn’t as dark as the permanent #4 Dore which I also own and wear like a bronzer. I’ll show you that one day. This comes in the new Meteorites formula, so it is quite soft and you will notice that it looks quite dusty in the pot. This also means that it is very easy to pick up the product and dust it all over your skin but you can end up picking too much. I don’t find the Perles d’Etoiles to be as shimmery as the Perles de Nuit (which I love for giving an AMAZING glow to the skin in all conditions) and it isn’t as pink as the Crazy Meteorites from last year which I passed on because I thought the tin was awful. Perles du Dragon gives a whitish cast to the skin under the glow while Perles d’Etoiles adds warmth to the skin the way #3 Medium (Teint Beige) might, but with a bit more shimmer/glow. You see, Rouge Parade 820 is almost exactly Garconne 25 which is a permanent shade! 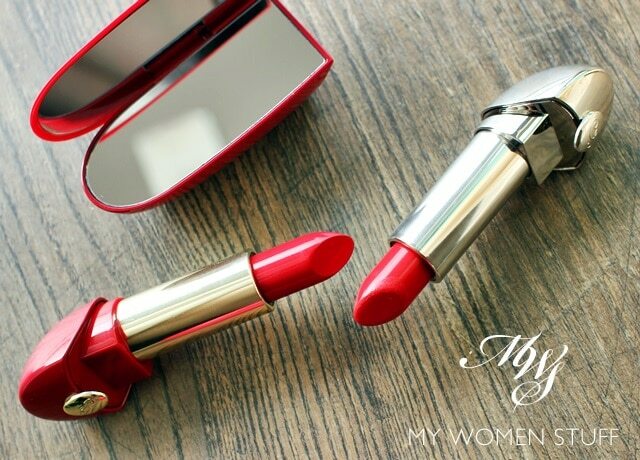 Garconne is one of my favourite red lipsticks so I didn’t mind that they were practically identical twins barring the packaging. But if you want to save your money and aren’t suckered in by the packaging, then get Garconne. It’s gorgeous. Like all Rouge G, the formula of the lipstick is creamy, long lasting, not drying, beautifully pigmented and flattering. 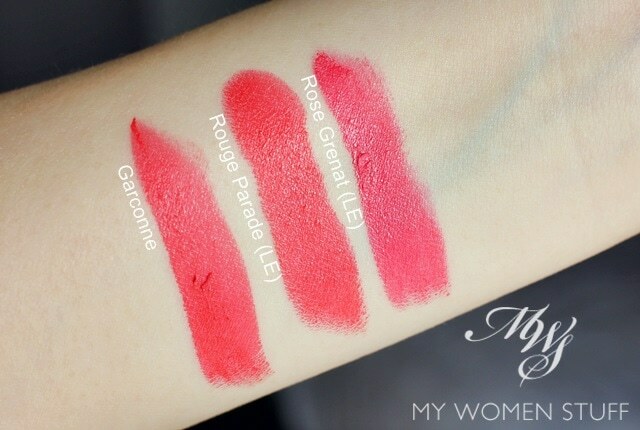 Few lipsticks can beat the luxurious creaminess, colour and texture of Guerlain Rouge G and those that do also cost a pretty penny so it’s in good company. For completeness, here’s how Rouge Parade looks when I wear it. So that’s it. All I plan to get from Guerlain’s Holiday collection this year. To be honest, I feel that it’s a bit of a take it or leave it situation, even with the 2 items I picked up. If you’re a collector and a sucker for pretty packaging, you’d get them the way I did. But I can’t say that everyone will get it. Do you plan to pick up the Perles d’Etoiles? Are you eyeing anything else from Guerlain from their Holiday collection? I just got my Perles d’Etoiles and I absolutely love it! So gorg, and being LE only makes the wanting worse. One thing I did notice was the fact that the amount of balls we’re getting is very less. (lol) They used to have more, didnt they? And dont get me started on how hard it was to hunt them down. Seems that only Pavilion has it, and the KLCC outlet doesnt have it in yet. Does anyone know what is the missing 6th perle? I also counted 5 hehe! PS:Rouge Parade looks so amazing on you! ? YAY for getting the Perles d’Etoiles! Yes, it’s absolutely gorgeous and luxe and yes, the bloody LE thing does make us want it more. Damn cosmetic companies and their marketing techniques 😛 Oh and yes, we’re only getting 25g this time, same with the permanent range. Definitely a lot less than before and one day, all we’ll get is maybe 3 balls 😛 Or 6 since they always have 5-6 shades HAHA! If you like red lipstick, definitely get the lippie but even if you don’t, get Garconne instead. It’s permanent and the only thing that’s different is that it’s in silver instead of red and gold packaging! OOO shiny! I don’t even know when this collection will be available here, but I’m hoping soon! Wouldn’t say anything is a must-have for me, but everything would be a nice-to-have for sure! Absolutely! It goes straight into the Meteorites drawer haha 😀 Are you getting it then, Lily? Oh yes you got them balls! haha! safe to say that i’m glad i got the perles d’etoile too, it’s been in my wishlist like for these entire month! The sixth pearl’s shade looked terribly similar to the beigy-silverish one if you look closely lol. You said it Lisa! Last year’s looked pretty but the tin was a disaster. Fortunately they had the pressed version so at least I had SOMETHING from last year LOL 😀 I hope you’ll be able to get your hands on them. I thought I saw that the eye and blush palette is out in Singapore already but I haven’t seen pictures of anyone posting about the pearls so hopefully they don’t sell out too quickly! Oh and thanks for the compliment. You’re right, good skin is still the best makeup and while I don’t have the best, it’s probably at the best state it’s been in for a while. I credit facial oils and a diligent skincare routine because my sleeping patterns are still crap and my food too! So definitely not a lifestyle change 😀 Thanks for noticing! I’d definitely buy that lipstick just for the packaging, it’s gorgeous! And so is the colour. Not sure about the Meteorites though, they look a bit boring. Yep, the Meteorites are like a more shimmery and golden Teint Beige 🙂 The lipstick however would be gorgeous! That lipstick on you… to die for! So gorgeous! I\’ll probably pick up the balls but not the lipstick as I\’m not a fan of Rouge G in general although both Garconne and Rouge Parade are beautiful. 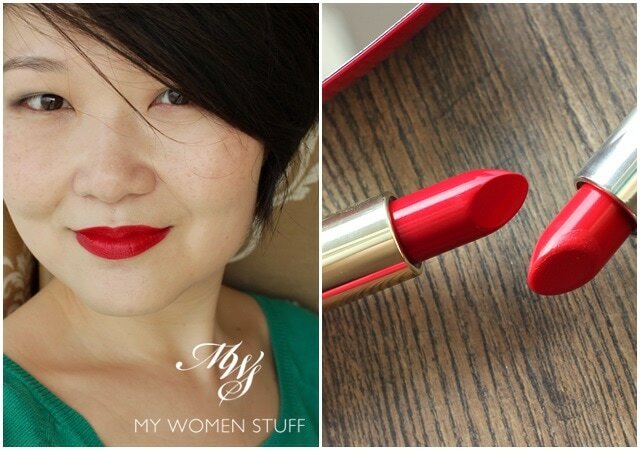 That shade of red lipstick is so gorgeous on you, it’s actually a positive that you (effectively) have two now! Stealth backup! Oh, what a beautiful color on you! I am soooo tempted to get the pearls. Do you think it would suit my skin tone since you mentioned that its similar to Teint Beidge? That Rouge G packaging is gooooorgeous!